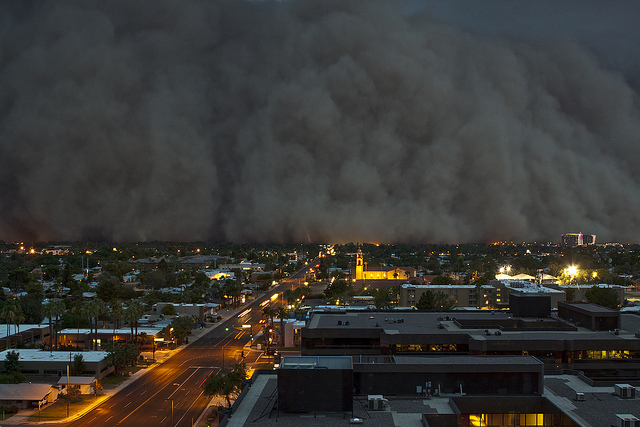 Our re-entry to Phoenix, after a cool and lovely trip to Northern California, was not only welcomed by the largest haboob (sand storm) in recent history… but HUMID heat. Whatupwitdat? It’s supposed to be a dry heat. We’re famous for DRY heat. We got into our van on the day after we arrived home and the thermometer was burning the number 118 into my sweaty eyeballs. Nora, my 7-year-old, who is experiencing her first Phoenix summer, whined, “Why couldn’t we just stay in Tahoe?” I wondered the same thing! Dry 107 is NOT the same as humid 107. Not even close. My plan to have the garage cleared for my van’s shady shelter through the scorching months has not yet materialized. It’s too hot to clean the garage. Why didn’t I think of this in January??? I went out there quickly at 7:00 am and analyzed the situation. Biggest obstacle: city-certified rolling trash AND recycle cans. They are huge… and stinky on occasion. All the other junk (hockey nets, weight bench, bicycles, hockey equipment, kayaks, huge alternative fuel gas tank, shop vac, etc.) can be put on the unseen side of the house in the backyard. But the non-attractive rolling trash receptacles have to be accessed on different days and dragged to the road. “Put them behind your side gate,” is the logical answer. But we have Houdini, the escape dog, as a beloved pet. Not only is our side gate double supported with plywood on the back (because of Houdini breaking the slats to escape) but there are cinderblocks on both sides of the gate, so Houdini won’t push through. There is a 4×4 buried in the ground under the gate as well, to hinder dig-through escape attempts. Houdini is only 11 pounds. But she is a wily and surprising 11 pounds. So, my plan is to keep the cans in the front yard on the side of the house that is least visible from the road. AND, get this, put a huge pot with a prolific plant in front of them. We have Nazis on our HOA board, but I think this might work. Afterall, we haven’t received a letter from them in at least two months now. The letters have come regularly… for six years…. every few months… for basketball hoops… wrecked cars in the driveway…. cars parked in the street… weeds…. garbage cans NOT behind the gate… and my personal favorite, 50 pink flamingos standing in our yard. Hey, the pot-with-prolific-plant shield is worth a try so I can get the van in the garage. I’ll keep you posted.